For the 2010 film, see Love Shack (film). 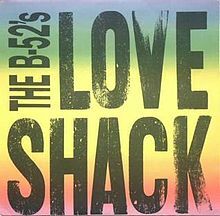 "Love Shack" is a 1989 single by new wave band The B-52's, from their album Cosmic Thing. It is considered the band's signature song, and has been a concert staple since its release. The song was a comeback of sorts, following the band's decline in popularity in the mid-1980s and the death of their guitarist Ricky Wilson in 1985. Produced by Don Was, the song's inspiration was "a cabin around Athens, Georgia", complete with tin roof, where the band conceived "Rock Lobster", a single from their first album; it is often said to have been located off the Atlanta Highway (US 78 Bus. and SR 10). B-52's singer Kate Pierson lived in the cabin in the 1970s, and the cabin existed until 2004 when it burned down. Cindy Wilson's line "tin roof rusted" was originally an outtake from a jamming session, where Wilson continued her line while the tape had stopped. The band added this section to the song, and the line has become erroneously associated with getting pregnant. The music video was directed by Adam Bernstein and shot at the home and studio of ceramic artists Philip Maberry and Scott Walker in Highland, New York. It is also the first time drag queen RuPaul had ever appeared in any type of media before his own turn as a singer and model only a few years later. The song received a number of accolades following its release. Named as one of the 365 Songs of the Century in 2001, the video for the song received an award from MTV as the Best Group Video, and was named the Best Single of 1989 by Rolling Stone. Additionally, it was ranked #246 in Rolling Stone's list of the 500 Greatest Songs of All Time. The single release contained various tracks depending on the country it was released in. Some countries, including the United States, had singles backed with "Channel Z", while other releases included a live version of "Rock Lobster" as the B-side. A reissue single in the U.S. paired it with the follow-up single "Roam", which had also reached number 3. In 1998 and 1999, the single was released again with a number of remixes, including one by DJ Tonka, but the re-release did not chart in the United States, although it did enter the United Kingdom charts. "Love Shack" was played in the third-season finale of Full House, where Stephanie danced to the song at the "We Love Our Children" telethon. The Simpsons parodied the song in the 1999 episode "E-I-E-I-(Annoyed Grunt)" with a song titled "Glove Slap" over a montage of Homer challenging Springfield residents to a duel with gloves, as well as the end credits. This parody was also sung by the B-52's. The song is heard in the 1991 film Frankie and Johnny, when Johnny (Al Pacino) interrupts Frankie's (Michelle Pfeiffer) bowling league, vying for her affections, to her dismay. The song was used as a lip-sync song in the 2nd episode of the 9th season of the show RuPaul's Drag Race which the B-52's were also guests on. The song was parodied during a karaoke performance by Mimi and Steve during season 8 episode 17 of The Drew Carey Show. ^ Wilkerson Daily Corporation, ed. (1990). The Hollywood Reporter, Volume 315, N° 1 to 17. ^ "The B-52s". B-52s. Archived from the original on 27 May 2013. Retrieved 28 July 2013. "From groundbreaking songs like "Rock Lobster," ... to chart-topping hits like "Love Shack" ... the B-52s' unforgettable dance-rock tunes start a party every time their music begins." ^ a b David Mansour, From Abba to Zoom: A Pop Culture Encyclopedia of the Late 20th Century. Andrews McNeel Publishing, 2005. ^ a b "B-52's 'Love Shack' burns down". The Associated Press. Today.com. 16 December 2004. Retrieved 28 July 2013. ^ Richie Unterberger, Samb Hicks, Jennifer Dempsey. Music USA: The Rough Guide. Rough Guides, 1989. ^ Fred Bronson. Billboard's Hottest Hot 100 Hits. Watson-Guptill, 2003. ^ "Emmy Nominated Director's Strange Trip: From Sir-Mix-a-Lot's 'Baby Got Back' to 'Fargo'". TheWrap.com. 30 July 2014. Retrieved 4 September 2016. ^ "HOUSE PROUD; Thrill Rides on the Color Wheel". The New York Times. 1 May 2003. Retrieved 4 September 2016. ^ "RuPaul's Early Life". Wikipedia. Retrieved 12 March 2019. ^ "The B-52's - "Love Shack" (Official Music Video)". The B-52's. Retrieved 12 March 2019. ^ "Songs of the Century". Archives.cnn.com. Cable News Network LP, LLLP. 7 March 2001. Archived from the original on 24 October 2008. Retrieved 28 July 2013. ^ "Rolling Stone's 500 Greatest Songs Of All Time". Rolling Stone. April 2010. Retrieved 3 November 2015. ^ "The B-52s Unofficial Discography: Love Shack". Theb52s.de. Archived from the original on 1 November 2005. Retrieved 24 January 2007. ^ "The B-52s Unofficial Discography: Love Shack 99". Theb52s.de. Archived from the original on 14 September 2000. Retrieved 24 January 2007. ^ "Australian-charts.com – The B-52's – Love Shack". ARIA Top 50 Singles. Retrieved 28 July 2013. ^ "Ultratop.be – The B-52's – Love Shack" (in Dutch). Ultratop 50. Retrieved 28 July 2013. ^ "Dance/Urban - Volume 51, No. 10, January 20, 1990". Library and Archives Canada. Archived from the original on 28 December 2012. Retrieved 13 June 2013. ^ "Retail Sales - Volume 51, No. 7, December 16, 1989". Library and Archives Canada. Archived from the original on 27 September 2013. Retrieved 13 June 2013. ^ "Top Singles - Volume 51, No. 7, December 16, 1989". Library and Archives Canada. Archived from the original on 17 March 2016. Retrieved 13 June 2013. ^ "Lescharts.com – The B-52's – Love Shack" (in French). Les classement single. Retrieved 28 July 2013. ^ "The Irish Charts - All there is to know". IRMA. Retrieved 28 July 2013. Only one result when searching "Love shack"
^ "Nederlandse Top 40 – The B-52's - Love Shack" (in Dutch). Dutch Top 40. Retrieved 28 July 2013. ^ "Dutchcharts.nl – The B-52's – Love Shack" (in Dutch). Single Top 100. Retrieved 28 July 2013. ^ "Charts.nz – The B-52's – Love Shack". Top 40 Singles. Retrieved 28 July 2013. ^ a b "B-52's". Official Charts Company. Retrieved 7 October 2018. ^ a b c d "Cosmic Thing awards at Allmusic". Allmusic. Rovi Corporation. Retrieved 13 June 2013. ^ "Billboard Top 100 - 1989". Billboard. The Longbored Surfer. Archived from the original on 25 January 2010. Retrieved 6 October 2013. ^ "End of Year Charts 1990". Recorded Music NZ. Retrieved 3 December 2017. ^ "Billboard Top 100 - 1990". Billboard. The Longbored Surfer. Archived from the original on 2 January 2014. Retrieved 28 July 2013. ^ "1990 Top 100 Singles". Music Week. London, England: Spotlight Publications. 2 March 1991. p. 41. ^ "Stephanie's dance to Love Shack Baby". YouTube. 29 April 2011. Retrieved 28 October 2015.